There’s always an element of surprise involved with the game of tag. That moment when you become “it,” no matter how fast your friend was gaining on you, you’re always a bit shocked that she finally caught up with you or that her arm could stretch out far enough to reach you. Like the childhood game it’s named after, Warner Bros.’ new R-rated comedy “Tag” directed by Jeff Tomsic (“Comedy Underground with Dave Attell”) is also a bit surprising. Inspired by the true story of 10 childhood friends from Spokane, Washington, who reunite every year to play the game of tag even though they’re now adults, the fictional film is not only funny, but also quite heartfelt, and may shock viewers by causing a few surprise tears at the end. 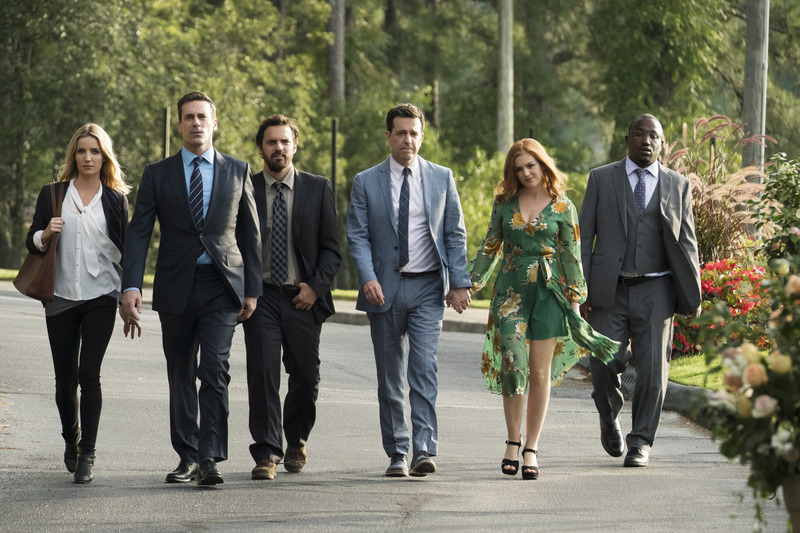 Every May, childhood friends Hoagie (Ed Helms, “The Hangover”), Callahan (Jon Hamm, “Mad Men”), Randy (Jake Johnson, “New Girl”), Sable (Hannibal Buress, “Broad City”) and Jerry (Jeremy Renner, “The Avengers”) stop whatever it is they are doing to play an elaborate game of tag. The person who is “it” at the end of the month lives the rest of the year with the disappointment of being the last person tagged and starts off the game next year by trying to tag someone else. When viewers are first introduced to the quintet—whose characters, for the record, are not based on any one particular real-life tag player—Hoagie is “it” and decides to leave his job in the medical field to apply as a janitor at Callahan’s office. That way, Hoagie can catch Callagan off-guard during an interview he has scheduled with a major newspaper and successfully make the first tag of the season. Naturally, the newspaper reporter (Annabelle Wallis, “The Mummy”) whose interview is interrupted by the two friends’ childish antics is more intrigued by this group of grown men traversing the nation every year to play a game of tag than the story she initially was assigned and decides to follow Hoagie and Callahan as they reunite with their other tag partners. This year, it turns out, the stakes are higher than ever, as Jerry—who in 30 years has never been tagged—is retiring from the game after he gets married at the end of the month. Hoagie is determined once and for all to tag Jerry, which ends up being even more of a challenge than usual since the group signs an amendment to the game’s rules stating that they can’t go after Jerry any time an official wedding event is taking place in order to please his bride-to-be, Susan (Leslie Bibb, “Popular”). Nevertheless, Hoagie, Callahan, Sable and Randy are willing to do whatever it takes to finally have the satisfaction of telling Jerry “You’re it”—which in Hoagie’s case, includes playing Jerry’s last year of tag as if his life depended on it. Truly nothing and no one outside of the wedding is off limits as the five friends continue to tag each other throughout the month—or in Jerry’s case, escape being tagged. Although girls aren’t allowed to play the game (childhood rules), several of the women in the players’ lives act as secret weapons, including Hoagie’s very competitive wife, Anna (Isla Fisher, “Wedding Crashers”), and Cheryl (Rashida Jones, “Parks and Recreation”), the childhood crush who continues to come between Randy and Callahan even as adults. As silly as the story sounds, there’s something truly endearing about watching a group of men continue to play a game of tag because they believe in the old saying, “We don’t stop playing because we grow old; we grow old because we stop playing”—especially knowing that “Tag” is inspired by a true story. While some of the movie’s scenarios—including Hoagie being tagged one year while at his father’s funeral—are based on actual experiences of the real group of tag partners whose story was covered by Russell Adams of “The Wall Street Journal,” screenwriters Rob McKittrick (“Waiting…”) and Mark Steilen (“Mozart in the Jungle”) obviously took some liberties to make “Tag” even more over-the-top than its outlandish yet based-in-reality premise. One sequence in particular toward the end of the film involving Bibb’s character is both horrifying and hilarious all at once and will leave viewers questioning just who is playing whom. What makes “Tag” different from other action-packed comedies is that the film is about something more than extreme physical gags. At its core, it’s really a story about friendship and brotherhood. Although attentive viewers will catch some foreshadowing of what’s to come early on in the film, the ending still packs an emotional punch that audiences will remember much longer than the lengths the characters will go to make a tag—even though the booby-trapped forest scene is quite funny. All five leading men do a commendable job with their roles, although it’s probably the least well-known actor of the bunch, Johnson, who delivers the funniest performance. The women also do a decent job with the limited screen time they are given, especially Fisher, whose character’s competitive streak and crazy nature makes viewers think that she could take out any of the five male players if she was allowed to play the game. The true scene-stealers of “Tag,” however, are the real men the film is loosely based on. At the end of the movie, audiences are treated to real-life footage of the guys playing tag. Viewers can’t help but leave the theater smiling after watching the comical video clips and will likely want to go home and read more on their sweet story. While “Tag” isn’t the funniest comedy to ever hit theaters, it is highly entertaining and much better than early trailers made the film look. In the era of social media where people virtually “poke” each other to show someone they’re thinking about them, it’s nice to hear about a group of grown men who go the distance every year to keep their childhood friendship alive. Next Post‘Pacific Rim Uprising,’ ‘Death of Stalin,’ ‘Agatha Christie,’ More on Home Entertainment … Plus a Giveaway!! !